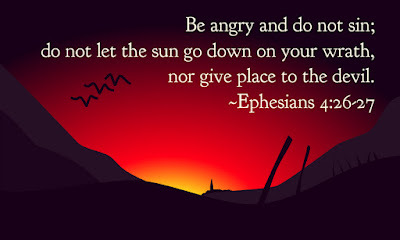 "In your anger do not sin" (Ephesians 4:26). Not all anger is sinful. The Bible shows us that God became angry with people on more than one occasion. The problem is that because we are sinners, we often become wrongly angry or allow sin to become mixed with our righteous anger. The first cause of anger is disappointment, the second is frustration, and the third is pain. In reality, they are all different ways of saying the same thing. What hurts about disappointment and frustration is the pain that they cause us. Ultimately, then, we can boil it down to one fundamental cause: pain. When we find ourselves suddenly erupting with irrational anger—as all of us have from time to time—it is because someone has poked a finger into a place where we are hurting. This is the first thing to understand in dealing with our own anger, and with the anger of other people against us. When someone blows up at us, we feel pain and it is easy to become angry back at them. Suppose, though, that someone says to us, “Friend, you really hurt me the other day, and I feel I need to let you know how I’m hurting.” Well, we don’t want to cause other people pain, and so we are not likely to bristle when they expose their hurt to us. Rather, we want to heal the breach. But when someone explodes at us, he is really saying the same thing. Just as anxiety is sometimes caused by specific things, so is anger. The best way to deal with anger is to look at ourselves, or at the person angry with us, and find the place of pain. Then we can deal with it. Also, though, just as there is a pervasive anxiety in our lives caused by our imperfect relationship with God, so there is a pervasive anger in our lives caused by the pervasiveness of pain in our lives. We need to understand this and learn to deal with it properly. Have you noticed how often in the psalms the psalmist will express his anger toward God? Wrestling with God in the face of our pain is one of the best ways to deal with anger. Another is to learn to be angry about what God is angry about. If you want to learn to master your anger, begin in the psalms. If you are experiencing deep hurt today, read Psalm 88, personalizing the parts that describe your situation.